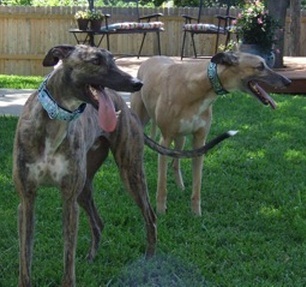 About six months after I adopted my first greyhound Beaker (GALT's Alf), I started thinking about getting him a brother or sister. I decided to try fostering to see if he liked the companionship. I was also hoping to find a foster I would fall in love with. I was on my second foster when I met Ray. I would bring my foster to Meet and Greets and Ray would be there with his foster mom, always in the back, always a little scared. He had a cute little furrow between his eyes and he melted my heart a little more every time I saw him. When my current foster was adopted I asked if I could then foster Ray. I knew within hours that he was in his forever home, and shy Ray became my Cricket. Cricket is still shy around strangers but he is much quicker to warm up. At home he is a goofy, confident, vain, funny boy who loves his sweet and quiet big brother Beaker. They are each perfect in their own way and they are both the loves of my life. Thank you GALT for giving me a family.